The takeover of power by the Zimbabwe defence force is a military coup in all but name. It represents a turning point in post-independence Zimbabwe and the almost certain end of Mugabe’s reign. The military take-over was precipitated by the dismissal of Mugabe’s most loyal henchman for the past thirty seven years, Emmerson Mnangagwa. This was part of the 93-year old Mugabe’s manoeuvres in Zanu-PF party structures to ensure his 52-year old wife Grace, would succeed him as president. However welcome the end of Mugabe’s reign may be, the military’s intervention is taking place behind the backs of the masses. To pre-empt the independent movement of the masses, such as the 2016 Tajamuka protests, the military is drawing in the elites, including the opposition, into a political arrangement to impose on the masses a dispensation whose primary aim is to maintain the capitalist status quo. But, notwithstanding this, Mugabe’s removal may be the trigger that re-ignites mass movements, something that would pose urgently the need to draw the lessons of past struggles in Zimbabwe and beyond. Mugabe’s actions had in the recent period become increasingly erratic. In power through electoral fraud and violence since the 2002 presidential elections, he had presided over an economy that experienced the highest inflation rate in world history rendering the Zimbabwe Dollar completely worthless. It led to the forced abandonment of the currency and its substitution with the US dollar and the SA Rand. The catastrophic economic collapse, 90% unemployment and mass starvation led to a mass exodus, mainly to SA, of at least a quarter of Zimbabwe’s 12 million population. The Africa Development Bank analysis of the economy revealed that “in 2016, Zimbabwe’s growth more than halved to 0.5% from 1.1% in 2015. The government responded to the challenging environment by instituting a raft of measures including a temporary ban on imports, issuance of bond notes and introduction of a command agriculture system. The events leading up to Mnangagwa’s sacking and those which have followed are the cumulative outcome of the Zanu-PF government’s successive failures since the ‘liberation movement’ assumed power nearly four decades ago. To many, the crises engulfing the ruling Zanu regime has been precipitated by its long ruling autocratic leader’s failure to appoint a successor. This is only partly true. Zimbabwe has long been in the abyss and this is the unravelling of the political superstructure that Mugabe himself built through that party in order to sustain his unchecked rule over the country. The initially popular Mugabe won successive landslide victories in elections until he implemented a brutal IMF/World Bank neo-liberal ‘economic structural adjustment programme’ that provoked the uprising of the mid-90s which saw the biggest workers’ protests in Zimbabwean history. However the turn of Zimbabwe’s then trade union leaders towards collaboration with capitalists and rich farmers against Mugabe disarmed this movement and allowed Mugabe to pretend he was a champion of the poor. Since then Mugabe has been able to stay in power by increasingly authoritarian methods backed up by the very same military that has now moved to oust him. Mugabe’s decision to pick his own successor was the straw that broke the camel’s back. With no record of struggle herself, the military feared that Grace Mugabe would be a force for instability. Grace Mugabe exponential rise to power thus played a decisive role in the expulsion of Mnangagwa precipitating the succession crises now unfolding in Zanu-PF. Drunk with the euphoria of power, Grace Mugabe and her G40 faction seemed to have assumed Mugabe’s role itself in dictating the programmes of Zanu-PF and by extension those of government. Mnangagwa who claims to have survived food poisoning a few weeks before his sacking has been leading a faction called ‘Lacoste’ which is backed by the military, and securocratic elements within Zanu-PF who have played a leading role in Mugabe’s reign of terror. With Mnangagwa’s flight into exile after his sacking it first appeared that his faction was on the back foot and had been relegated into the political wilderness. But as the events of the past few days illustrate, Mnangagwa’s military backers were not willing to accept defeat. But the Lacoste faction appears to have moved with the tacit consent of not just SA, but even also after consultation with China. Defence force commander, Major General Constantine Chiwenga is reported to have visited China recently. Mnangagwa himself is reported to have been flown back to Zimbabwe in a SA National Defence force military plane. The statement by the military that this is not a coup, merely an intervention to clear out the criminal elements that surround Mugabe, appears to be carefully crafted to allow the SADC, chaired by Zuma, and its ‘organ’ for ‘politics, defence and security’, chaired by Angolan president João Lourenço, to allow the military to complete their mission without coming under pressure to take some kind of action to show their disapproval for “regime change” by unconstitutional means. A military intervention is ruled out. SADC has not even been able to stabilise Lesotho. A military intervention to force regime change in Zimbabwe would ignite a conflagration they would have no control over. Economic sanctions, given the economic crisis, will merely aggravate the situation. The last thing the Zuma regime, which had just initiated steps to repatriate the large Zimbabwean population in SA, is to be obliged to suspend those plans for humanitarian reasons. It is thus far more likely that the ZDF will be given the time to stabilise the situation by managing Mugabe’s exit and to prepare for the elections due in 2018 with Mnangagwa installed as a caretaker president. Stabilising the situation will entail a purge of the G40 faction – a process that has already begun. The military will also attempt to portray itself as committed to fighting corruption, restoring conditions for the revival of economic growth and the restoration of social stability. The Zimbabwean masses have largely been spectators in the factional battles of Zanu-PF and have in recent days watched with delight as what appeared to be a self-inflicted implosion and the almost guaranteed demise of the Zanu-PF state. Sections of the masses will welcome this development seeing in it the lifting of the yoke of the Mugabe dictatorship.But this would be a mistake. Mnangagwa led the operation during the 1980s Gukurahundi operation murdering an estimated 20,000 Ndebele people. At the same time there is deep distrust in the military and few illusions that it represents hope or an end to the misery of the Mugabe regime. The military has been critical in sustaining the Mugabe dictatorship including carrying out systematic terror to enable Mugabe to keep firm control. Thus there should be hardly any illusions as to whether or not the military represents a tenable alternative for the working masses and poor. In 2016 Mugabe himself revealed that $15 billion of diamond revenue had been looted from the state coffers and was unaccounted for. A recent report revealed that the illicit outflow of diamond revenue was used to prop up the regime and companies which were linked to the military and the Central Intelligence Organisation. This is after the military massacred 200 people severing their limbs when it moved into the Marange diamonds fields east of Zimbabwe to ‘clear’ out ‘illegal’ informal miners in 2008. Neither a transitional government nor it successor will be sable to solve the problems of poverty and mass unemployment. The atrocities of the military remain well documented; its role in kidnapping and killing opposition supporters particularly during elections remains unquestionable. 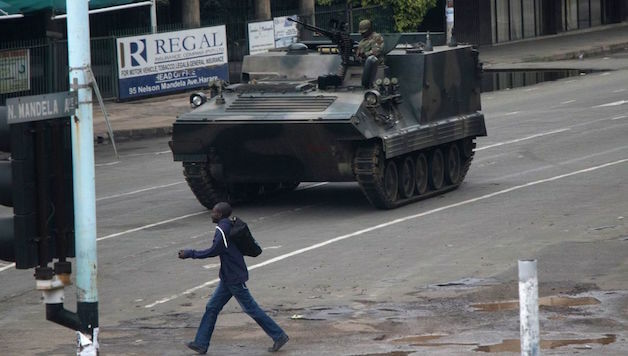 The military coup is not at all a change of the Mugabe-Zanu regime’s character but represents its continuation and attempt at the regeneration of the military’s control over it in a manner they hope will be self-sustaining. Its purpose is to guarantee the continuation of its autocratic rule and not to usher in a new democratic dispensation under the control of the Zimbabwe’s masses. The experience of recent years shows that much of the working masses of Zimbabwe understand this very well. This was evident in 2016 when there was a massive uprising and grassroots mobilisation in rejection of Mugabe’s regime. The military responded to this by standing firm and emphasizing its allegiance to Zanu-PF and Robert Mugabe. Therefore the general position of the povo (the masses) is that no alternative is to be found in the Zanu-PF state and all its manifestations or the remnants that may remain. The lesson both of last year’s mass mobilisation, as well as the whole of Mugabe’s tenure is that reliance on external forces such as SADC (Southern African Development Community) and neighbouring governments is futile and regressive. All the administrations of the South African government – from Mbeki through to Zuma – have propped up the Mugabe regime. After Mbeki suppressed the report of the Judicial Commission of Inquiry his own government had instituted which found that the 2002 presidential elections were not free and fair, Zuma followed the same policy until forced to release the report by legal action. The South African Communist Party (SACP) followed suit demonstrating its contempt for the Zimbabwean masses by denouncing the mass demonstrations as recently as last year as the work of a “third force” bent on regime change. The masses are their own liberators, the Zimbabwean experience of the last two decades confirms this. Only they can lead the revolution. It is foreseeable that for expedient purposes a ‘solution’ will be brokered by SADC or the AU, regardless of their claimed opposition to military coups, in order to legitimize the military junta’s rule. The struggle, however, continues. As previously emphasised by WASP, the masses of Zimbabwe can only rely on their own programme, their own power and their own organisation to overthrow the autocratic, capitalistic and parasitic bourgeois dispensation to achieve the socialist transformation of Zimbabwean society. The masses must, as they have previously, demonstrate their rejection of the uninvited imposition of rule by a junta that seeks to safe-guard its looting and plunder. Rejection of this dispensation must be carried out urgently and consistently by the masses so as to demonstrate the utter greed and blatant self-servicing motivation behind this military coup. The Zimbabwean masses, which includes the workers, the youth, and the diaspora must now congregate towards building a mass workers’ party. Such a party must learn from the lessons of the failed attempt in the late 1990s to build one and ensure a new workers’ party strives to lay the foundations of a government of workers and poor on a socialist programme so as to inflict a decisive defeat of the Post-Mugabe dispensation currently mutating. Reject Mugabe! Reject the generals! No to dictatorship – civilian or military. Full democratic rights! Demand a trial of Mugabe and his cronies by representatives of workers and poor. The working class and poor must take the future of Zimbabwean society into their own hands. No to any coalition with leading elements from the old regime or capitalist forces. This demands a government of workers and small farmers. To prepare for this build mass democratic action committees of workers, youth, the unemployed, small traders and small farmers in every area to elect a transitional authority to lay the foundation for elections to a future government of workers and small farmers. Such a government must have a program to end low-pay, poverty and unemployment. decisions on the movement of goods, the running of services and other key decisions about the running of society Mass democratic committees of the Zimbabwean workers, small farmers and the poor to take; seize the assets of Mugabe, the generals, Zanu-PF and other regime leaders, placing them under the control of the action committees. Defend the people! Action committees to organise accountable and democratically controlled self-defence units to protect protests and activists from regime intimidation and violence; build action committees of rank-and-file police officers, soldiers and air personnel. Elect rank-and-file leaders and spokespeople and take no orders from regime-linked officers! Build links with the action committees of the people for a united struggle. No trust in the imperialist dominated anti-working class UN, AU or SADC. Build links with the working class across Southern Africa. Outside of Zimbabwe organise action committees in all Zimbabwean diaspora communities building strong links with local communities and working class and youth organisations. United struggle against xenophobia. Fight for migrants rights. Organise migrant workers in the trade union movement. Workers and young people to take the lead in building a mass revolutionary party to struggle for a socialist Zimbabwe.